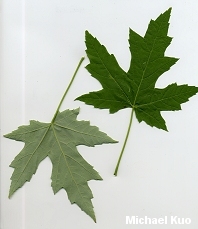 Leaves with deeply cut lobes and silvery undersides, fluttering in the slightest wind; "helicopters" produced in spring; growing (naturally) in lowlands and moist areas. 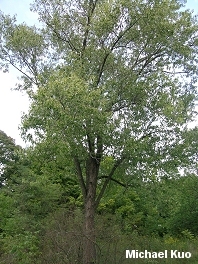 Habitat: In moist areas, usually in riverine ecosystems. Stature: 60-80 feet high; to 3 feet in diameter; often splitting into 2 or more main trunks; when mature featuring a broad, rounded crown. 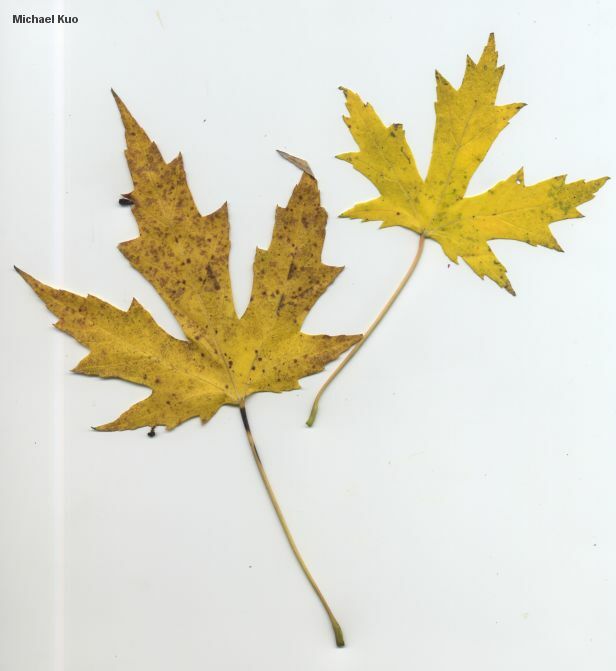 Leaves: 4-7 inches long; simple; with 5 deeply cut lobes separated by V-shaped sinuses; smooth; light green above; silvery to whitish below; turning yellow in the fall. 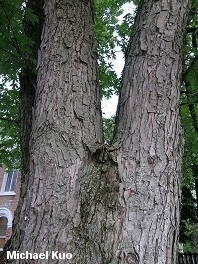 Bark: Gray; at first smooth, becoming cracked-scaly. Fruit: A green "helicopter" about 2 inches long, appearing before the leaves in spring. 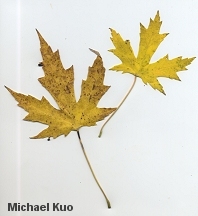 Maples are not mycorrhizal, but some saprobes are dedicated to decomposing silver maple wood and debris, including: Armillaria tabescens (especially in urban settings), Polyporus squamosus, and others.